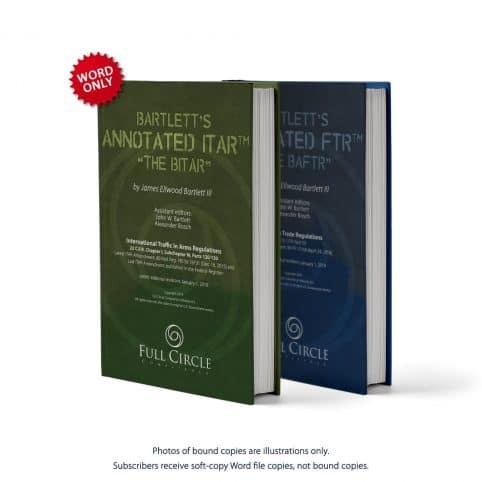 By purchasing this product you will be subscribed and gain access to “Bartlett’s Annotated ITAR (BITAR)” & “Bartlett’s Annotated FTR (BAFTR)” and their updates for the period of one year. Prior to the ending of your year subscription you will be notified that your subscription is up for renewal, and receive instructions to do so. The Annotated Regulations are sold as soft copies in Microsoft Word, which are emailed to subscribers every time the regulations are amended, plus occasional updates to add footnotes, cases, agency guidance, and Index entries. We do not sell bound copies of the Annotated Regulations, but subscribers who prefer a hard copy may print a copy themselves for inserting in loose-leaf binders or contact FCC for special prices if you would like to receive loose-leaf copies. By purchasing this combo product you will save $25 on your annual subscription. The BITAR contains the full text of the International Traffic in Arms Regulations, 22 C.F.R. §§ 120-130, with features added by the author, including a Table of Contents, footnotes, section histories, appendixes containing government guidance, user aides, and an Index. The BITAR will be amended every time the official ITAR is amended, usually within 48 hours of publication in the Federal Register, and subscribers will be notified by email that a new edition is available for download at no extra cost. The latest ITAR amendment is of 14 Oct 2018: 83 FR 50003-50007: Regulatory Reform Revisions to the International Traffic in Arms Regulations. Hence, the best way to ensure you have an up-to-date copy of the ITAR is buying this annual subscription to the BITAR. The Annotated FTR, popularly known as “Bartlett’s Annotated FTR (BAFTR)” is the only version of the U.S. Foreign Trade Regulations,15 C.F.R. Part 30 (20 Sep, 2017), available in Microsoft Word, and fully updated with the latest amendments. The BAFTR contains the full text of the Foreign Trade Regulations, with features added by the author, including a Table of Contents, footnotes, section histories, appendixes containing government guidance, user aides, and an Index. The BAFTR will be amended every time the official FTR is amended or a new FTR letter is published, and subscribers will be sent copies of the new edition at no extra cost during their annual subscription. The last FTR amendment is of 24 Apr 2018: 83 FR 17749-17751: Foreign Trade Regulations (FTR): Clarification on the Collection and Confidentiality of Kimberley Process Certificates. The best way to ensure you have an up-to-date copy of the FTR is to subscribe to the BAFTR. All publications are copyrighted material. Unless authorized by a site license, the publications may not be transferred to a nonsubscriber or posted on a server or other location that allows access by a non-subscriber. A subscription to these publications provides the subscriber with a year-long individual use license or a site license for access by multiple employees at a prices varying with the number of employees given access. The publications and their updates may be saved for reading on the subscriber’s individual computer or printed as hard-copy for use by the subscriber. Unauthorized duplication or access to copies is a copyright violation. However, a subscriber may print a single copy and allow others to read it, so long as no other copies are printed by or for nonsubscribers.